Today marks 200 years since Jane Austen's book Pride and Prejudice was first published so what better way to mark it than name a blog post after the book! Jane Austen's novels have been loved by generations and adapted into films and dramatised on the television. They are of course 'period dramas' but who doesn't like an old fashioned romance?! PRIDE -- I am so proud of what 'im in the garage' does and this is what he has just made especially for me. We were sent some ironwood last year and it was only enough to make a shuttle and a hook with hat. 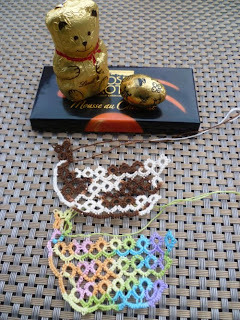 PREJUDICE-- When it comes to using a crochet hook to add beads, therefore I have abandoned the idea in sheer frustration. My problem is that every time I attempt it I seem to split the thread and make more mess. So I have gone back to a needle and thread until I can be persuaded otherwise! As you can see from the picture above the hook has a hat on but making them is very time consuming so the garage man is wondering whether, instead of making a wooden hat, in future they could just have a plastic cover, as in the picture below. Then at least the hook will be protected. Jane Austen died in Winchester, not far from where I live, she is buried in the cathedral. "Jane Austen. Known to many by her writings, endeared to her family by the varied charms of her character and ennobled by her Christian faith and piety was born at Steventon in the County of Hants, December 16 1775 and buried in the Cathedral July 18 1817. "She openeth her mouth with wisdom and in her tongue is the law of kindness". Apart from a few more paper clip projects, which I plan to do in the future, I have exhausted my craze with tatting on them for a while. 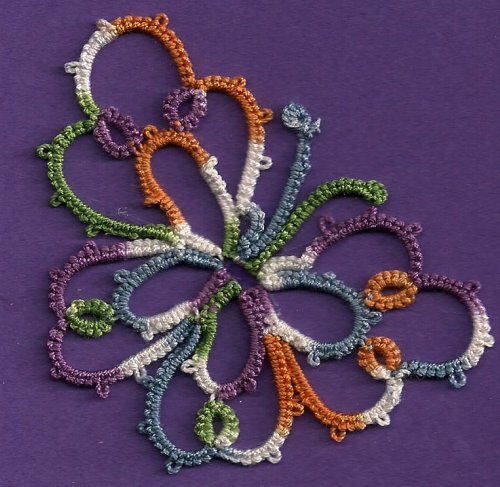 Also I remembered why I started to begin with, it was because my youngest son loved the one Ellen (Singtatter) gave me, and that was a first for him where tatting is concerned. I have yet to test him on the ones I have made! Thank you to all who gave some very helpful suggestions regarding paper clip patterns. I have yet to pursue them all, but here are the some of them. From left to right Sharren Morgan's snail. 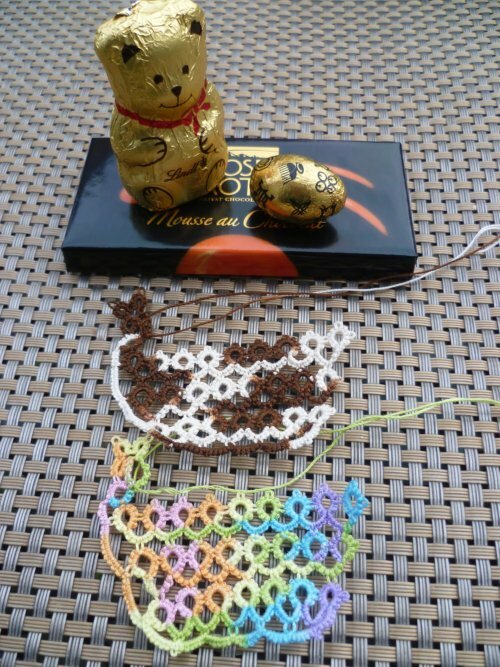 Jane's fish, Marie Smith's flower and Barbara Hevener's hasty heart (beads added). The fish and heart were not originally designed for paper clips, but I think they work. My favourite is Jane's beaver, mainly because part of my role in Scouting is giving certificates to leaders and this is how I plan to hand them out in future. I am also managing to keep up with Jane's TIAS, this is day 4 and 5 together. You probably all know why I am not making any guesses to what it is going to be! 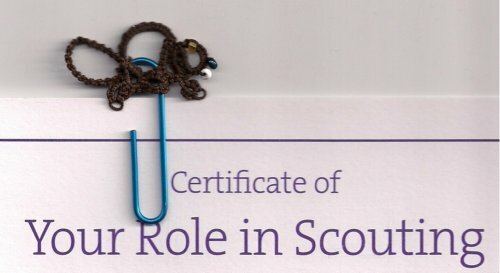 One of the many projects that I really wanted to try for some time was attaching tatting to paperclips. When I met Ellen (Singtatter) in Singapore last year she gave me a sunflower on a paperclip one of her own designs which you can see here. Whilst in the USA in September I was eager to purchase some larger paperclips as they were not easy to find in the UK. From left to right a butterfly, another of Ellen's designs. 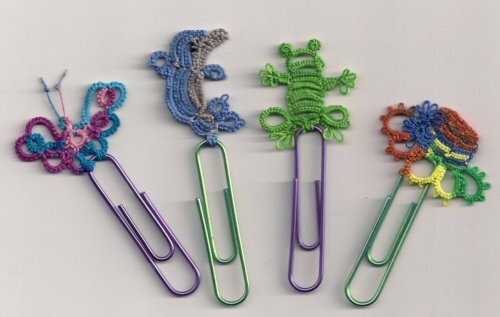 The dolphin, frog and hat all come from Martha Ess's books, using block tatting, and they fit well on the paperclips. And here is the packet I purchased in America, we went to Fred's Store, a fascinating place along with the Dollar Stores they were certainly a shopping experience! 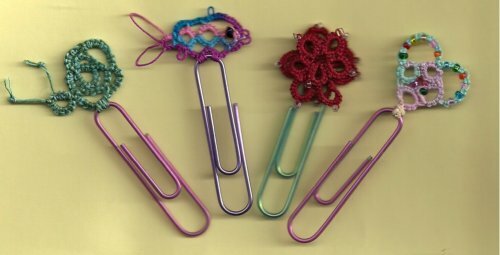 I still have a few more tatting patterns to try, but if anyone else has any suggestions of tatting designs that might work on paperclips please let me know. I might even start a craze! I ignored those who did not want to be entered into the giveaway and just put in the number of comments and used a random number generator and the winner is ................. I'll tell you later, you will have to read a bit more before I give the announcement!! My intention was that the chance to win a free gift was to be given to keen tatters who regularly visited my blog. However, because of "Craft Gossip" it sort of went "viral!" Still at least I have a few more followers, a very warm welcome to you if you have just joined my blog. Also some of you did mention in your comments about the fact that if you won, whether I would post to other parts of the world. I am more than happy to do this when offering a giveaway especially as most of my followers live in other countries. I found the butterfly on this blog, this is the only way I can acknowledge the designer, as I was unable to comment on the blog either. 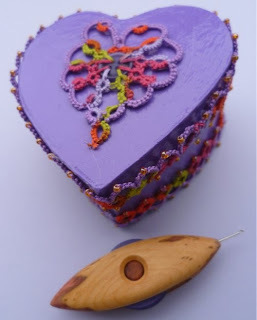 It is rather pretty and was relatively quick to make. Okay I will put you out of your misery! The winning number came out at 11 and that is Elizabeth, please could you e.mail me on popabobbinshuttle@gmail.com - many congratulations. Whilst I was in America last year people were very generous and here is an amazing tatting bag that Diana made and a shuttle that she blinged. Sue Anna handed them over to me whilst at Tat Days. Lelia mentioned her bag in one of the comments this is what she said, to save you trawling through them all! "My favorite gift was an origami bag / pouch made by Diane (Lace Lovin' Librarian) as I have used it nearly every day since I've owned it! I may even need to replace the draw string cord." It was great hearing about all the amazing gifts in your comments, thank you for sharing. My next task is to start Jane's TIAS which I might get around to later today. Finally thank you to everyone who entered this giveaway. 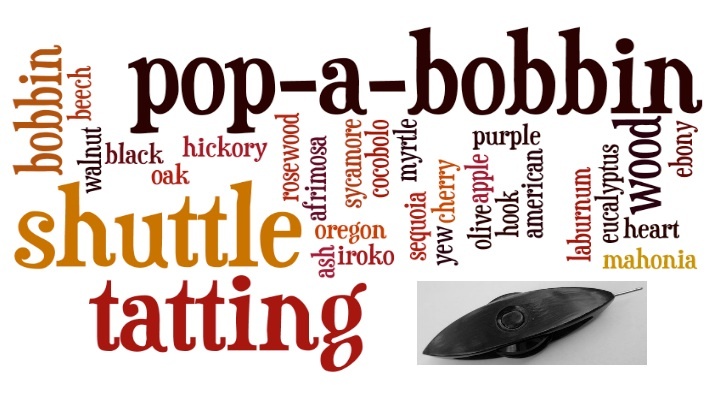 As I write more popabobbin shuttles are being made in the garage. When they are ready I will inform you. Today is the Feast of Epiphany and so I thought it was a very good day to offer a few gifts of my own. Although may I ask you kindly to enter if you are a regular follower of my blog or comment regularly. Sorry to put this restriction on the giveaway, but I do want those who genuinely would like to win the shuttle to enter and not people who try their chance for the sake of it. So please comment if you would like to win the pop-a-bobbin shuttle and the box at the same time adding your favourite all time gift, but it has to be an object and not a person! The shuttle is made from plum cherry and this is what it looked like before it was worked upon. Also the shuttle is unvarnished, sometimes this helps to show up the colours better. However, there are times times when the varnish enhances the grain. Now the other side of the shuttle. Last night I went to a 'Pies and Punch' evening to celebrate Epiphany and won this oil diffuser, for those unfamiliar you place the sticks in it and they absorb the fragrance contained in the oil and make the room smell nice. 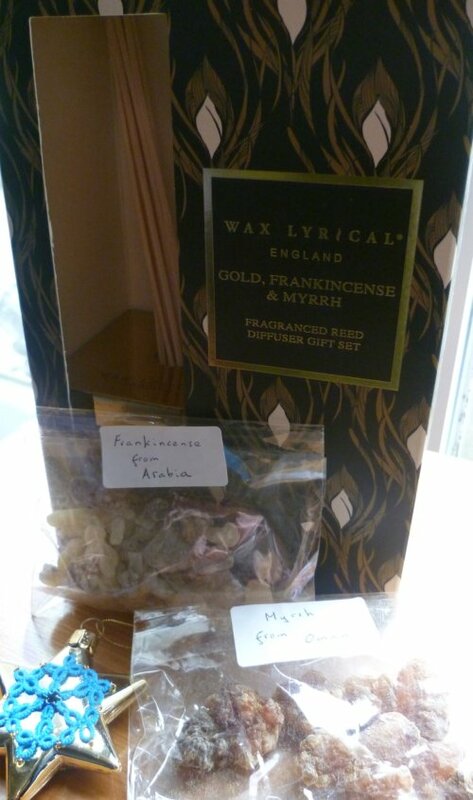 In front you can see a couple of bags with frankincense and myrrh and a gold decorated star. There are many traditions associated with Twelve Night, Epiphany Eve (The first night of Christmas is December 25–26, and Twelfth Night is January 5–6), in England it was a time for mumming and the wassail. The yule log was left burning until this day, and the charcoal left was kept until the next Christmas to kindle next year's yule log, as well as to protect the house from fire and lightning. The Irish call Epiphany Little Christmas or "Women's Christmas" (Irish: Nollaig na mBan). On the feast of the Three Kings the women of Ireland in times gone by had a bit of rest and celebration for themselves, after the cooking and work of the Christmas holidays. 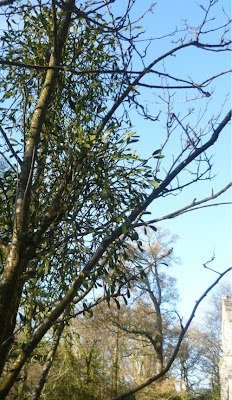 Another tradition at Christmas is hanging mistletoe, as seen in my previous post. In ancient times whenever enemies met under the mistletoe in the forest, they had to lay down their arms and observe a truce until the next day. From this has seemingly come the ancient custom of hanging a ball of mistletoe from the ceiling and exchanging kisses under it as a sign of friendship and goodwill. 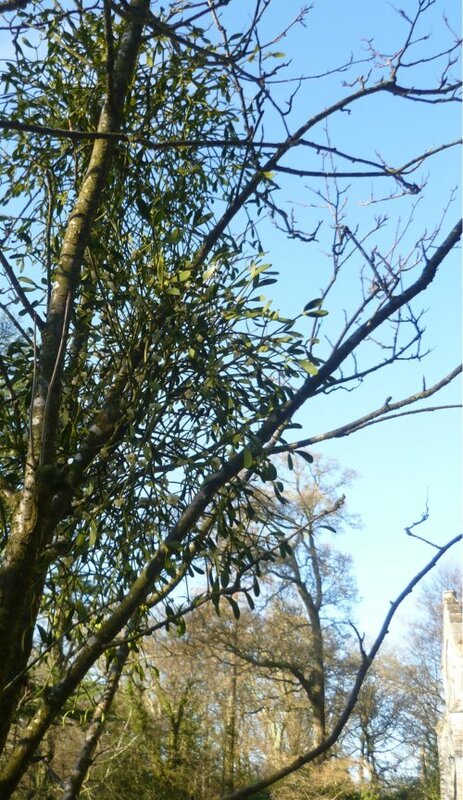 The picture shows mistletoe growing on a tree next to one of the churches, you can just see a part of the building at the bottom right hand side. So my friendship and goodwill is to offer you the shuttle and box and you have until Friday 11th January to leave a comment (which happens to be the same day as the start of Jane's TIAS). I will then announce the winner (using a random number generator) sometime over the weekend. I must also add that this is my 250th blog post. So the best of luck to all my friends near or far.